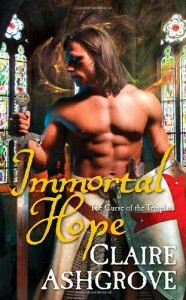 More and more I am finding the paranormal romance genre to my liking. I've only read a few books in two series so far, but in both cases, the writers did enough world building to make the story have enough depth beyond the romance to hold my interest. There are real issues, obstacles and dangers here, not just a broken heart. And those come in the form of demons, angry fellow nights and more. While I found the juxtaposition here of Templar Knights who speak like they are still living in a the medieval age while driving vans and living in an urban fantasy, contemporary setting a bit awkward at times, I enjoyed the strong plotting, characterization and pace. I think the battle scenes could have been unfolded in a bit more detail to make them a bit more powerful and realistic but they may well be very well done for typical PNR. I don't have enough basis for comparison. I also struggled with some of the knights who offered so little likeable about them while fighting with each other and yet defending each other like brothers. Yes, they come from an age where honor and oaths are blood ties almost and enough to overcome many obstacles, but I hope Ashgrove finds a way to make that more relatable and deal with those issues as the series progresses. It will add depth and sympathy to her characters and world that will enrich the series. Given that the knights in question are each destined for their own story, I think this is necessary to make them empathetic protagonists as well. The mystery of Anne's sister is left unresolved but I predict that perhaps somehow she and Tane will wind up together. They seem well suited in their selfish drives and self-focus. Time will tell if I got it right. Meanwhile, Farran is next in book 2 and I look forward to seeing what unfolds.